DAYTON LAWYER RECENTLY CERTIFIED IN DUI FIELD SOBRIETY TESTING BY NHTSA - Dayton DUI OVI Defender - Protecting Your Rights! 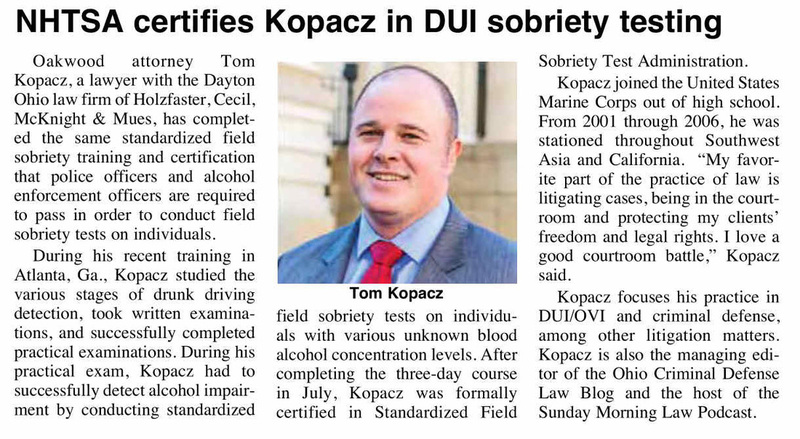 DAYTON OH, August 4, 2016 - To better assist and defend individuals accused of DUI/OVI offenses, Attorney, Tom Kopacz subjected himself to the same Standardized Field Sobriety training and certification that police officers and alcohol enforcement officers are required to pass in order to conduct such tests on individuals. During this recent training in Atlanta, Tom studied the various stages of drunk driving detection, took written examinations, and successfully completed practical examinations. During his practical examinations, Tom had to successfully detect alcohol impairment by conducting the Standardized Field Sobriety Tests on individuals with various blood alcohol concentration levels unknown to Tom. After the three (3) day course ending on July 16, 2016, Tom was formally certified in Standardized Field Sobriety Test Administration. Tom joined the United States Marine Corps out of high school. From 2001 through 2006, Tom was stationed throughout Southwest Asia and California. “My favorite part of the practice of law is litigating cases, being in the courtroom and protecting my clients freedom and legal rights… I love a good courtroom battle” Kopacz said. Mr. Kopacz practices law with the Dayton law firm of Holzfaster, Cecil, McKnight & Mues. 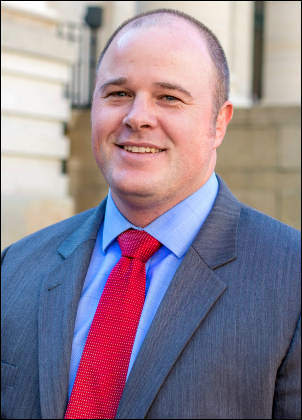 He focuses his practice in DUI/OVI and Criminal defense and other litigation matters. Tom is also the Managing Editor of the Ohio Criminal Defense Law Blog and the host of the Sunday Morning Law Podcast.